Reid Genauer can be booked through this site. Reid Genauer entertainment booking site. Reid Genauer is available for public concerts and events. Reid Genauer can be booked for private events and Reid Genauer can be booked for corporate events and meetings through this Reid Genauer booking page. Unlike most middle agents that would mark up the performance or appearance fee for Reid Genauer, we act as YOUR agent in securing Reid Genauer at the best possible price. We go over the rider for Reid Genauer and work directly with Reid Genauer or the responsible agent for Reid Genauer to secure the talent for your event. We become YOUR agent, representing YOU, the buyer. In fact, in most cases we can negotiate for the acquisition of Reid Genauer for international dates and newer promoters providing you meet professional requirements. 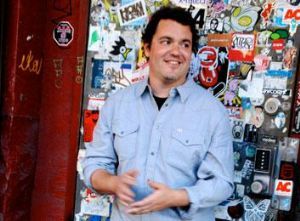 Reid Genauer is best known as a singer and songwriter. In that capacity he first hit the national stage fronting the band Strangefolk in the mid nineties. Since then he has gone on to cement his reputation as a prolific songsmith and band leader, fronting a second grassroots success story – The Assembly of Dust. Genauer’s success as a songwriter is qualitatively evidenced by the connectedness of his audience with his lyrics and quantitavily supported by two recent top 40 AAA hits: “Man With A Plan” from the Album Honest Hour and “Telling Sue” from Recollection. The music Genauer makes with Assembly of Dust could be labeled “hick funk,” and has been compared to the likes of Paul Simon, CSNY, and The Band. It differs from Strangefolk in that the songs are more detailed and more composed “ The musicianship and as a result the songs themselves are more subtle” says Genauer. “Where Strangefolk was screaming and unleashed Assembly of Dust is conversational and practiced” The commonality of both groups is ultimately a backbone of Genauer’s trademark songs, characterized by thoughtful lyrics, hooky melodies and earnest vocals. It is to that end that Reid Genauer steps out this spring to test his songs and his mettle as a singer songwriter and to capture his fans with one lone voice in a room full of listening. Book Reid Genauer for your next event! Would you like to have Reid Genauer perform at your next corporate event, party or concert? Simply fill out the simple interest form below, and we’ll start the booking process.